As Pope Benedict XVI approaches his groundbreaking retirement, commentaries and analyses of his legacy as pope are coming more and more quickly across the wire. 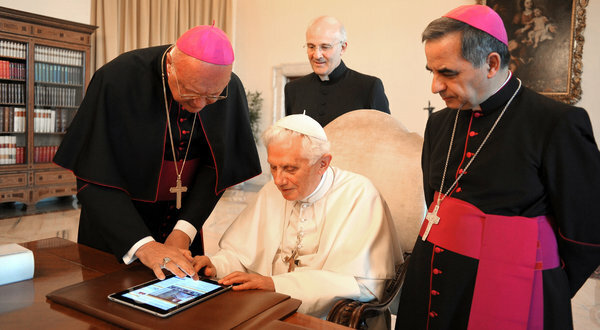 In my own way, I’d like to offer some thoughts on this pope’s use of social media. Following this, there are three question-response pairs of tweets, with the questions coming from Twitter members who used the hashtag “#askpontifex” and the responses coming from the pope. All in all, his first day was rather prolific for a Twitter neophyte. For all this, there is nonetheless no real evidence that whomever is in charge of the Pope’s social media has really attempted to do much with it. Following the initial use of “#askpontifex,” there has been only one other question-response set of tweets (on December 24th, about Benedict’s favorite childhood Christmas tradition). There is no use of “@” to respond to any of the feed’s followers; the feed itself uses no hashtags; and there are no tweets featuring pictures, videos, or links (not even a link to the Pope’s own World Communications Day message on social networking). As a medium, the Papal Twitter feed is used exclusively to disseminate Twitter-sized thoughts in a unidirectional way; the benefits and possibilities of this particular medium, after a brief flirtation, have not been explored. One might argue that it is premature to judge the pope’s use of Twitter, as he and his staffers are probably new to the medium and have not yet figured out what to do with it. However, this objection ignores that they clearly began this Twitter campaign with a social media strategy. They reserved distinct Twitter handles for a multitude of languages rather than have one message in nine languages released on a single feed. Prior to the first papal tweet, they released the #askpontifex hashtag in hopes that people would use it. That hashtag has subsequently been used for all manner of negative and insulting tweets at the pope, which may be why that experiment has apparently been disbanded. Nonetheless, part of having a social media strategy is knowing how to manage negative feedback and engagement (and evasion is not an overall effective tactic). Thus while the pope having a Twitter feed is perhaps a milestone, it is really not a very significant one. Perhaps the most distinctive feature is that the handle is @Pontifex, not @benedictusppxvi. In this way, the Twitter feed seems to remain with the office of pope, not with the person who occupies it. Social networks are the result of human interaction, but for their part they also reshape the dynamics of communication which builds relationships: a considered understanding of this environment is therefore the prerequisite for a significant presence there. If the Vatican hopes that its use of Twitter will be an effective witness to the Gospel, then it must attend to the ways this medium shapes the message and engage with that. Nonetheless, part of having a social media strategy is knowing how to manage negative feedback and engagement (and evasion is not an overall effective tactic). Now this prompts me to wonder, after initially wincing in recognition of other areas in which the institutional church has tried and failed to manage negative feedback by evasion, whether maybe, perhaps, social media might just possibly be an incubator for the emergence of more responsive and engaged approaches to criticism and negative feedback. Let us pray!